(CNN) -- The death toll stands at 200 in Saturday's ferry accident off the Tanzanian island of Zanzibar, a government official said. 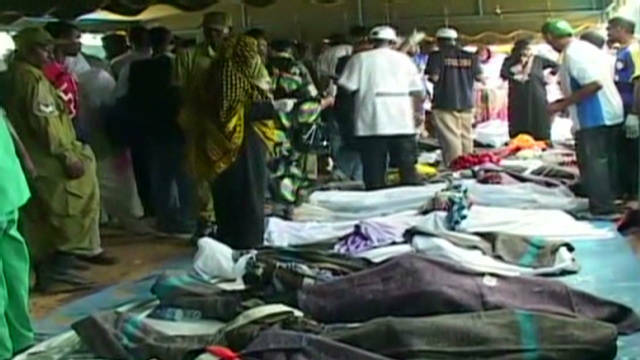 Rescuers saved 579 of the passengers from the overturned vessel, according to Zanzibar's state minister Mohamed Aboud. Among those rescued were 20 children, Aboud said. Most of the rescued were transported to local hospitals for treatment and some have already been discharged. The boat, overloaded with cargo and carrying more passengers than registered for the trip, hit strong winds and waves and capsized in the Indian Ocean, he said. With more than 120 tons of sugar, rice and wheat flour on board, the boat was carrying double the allowed payload, Aboud said. The ferry's manifest showed it was traveling between the islands of Zanzibar and Pemba with more than 600 registered passengers, according to the minister. But dozens of additional passengers, who were apparently not registered, had made their way on board, Aboud said. The boat had a capacity of 620 passengers, but more than 1,000 people were on board. The ferry, which capsized in predawn hours local time, sank in deep waters. The accident occurred too far from shore for survivors to be able to swim to safety, according to Zanzibar congressman Ismail Jussa. "They were all rescued by some of the boats used as ferry boats here in Zanzibar that volunteered to undertake the rescue operations," he said. Fishermen and hotels with boats also picked up survivors. CNN iReporter Ismail Katumba was waiting to take a boat from the island to his hometown of Dar es Salaam when the incident occurred. "You could hear people screaming loud and crying as bodies surfaced, mostly children," Katumba said. Relatives of passengers were identifying bodies of their loved ones under tents set up on the island, he said. In a televised address, Zanzibar President Ali Mohamed Shein called for three days of national mourning starting Saturday and for flags to fly at half staff. The government will provide for the burial of unidentified bodies from the disaster, Shein said, and maintain records for those searching for lost loved ones. Shein called for a commission to investigate the sinking. Pemba and Zanzibar, the two main islands on the Zanzibar archipelago, are popular among tourists for their pristine sandy beaches. Zanzibar is a semi-autonomous part of Tanzania.